When temperatures rise and you start to feel the heat, take these steps to cool down–and to avoid the dangers of heatstroke. One of multiple tips we offer to avoid heatstroke: If you enjoy exercising outside, do it first thing in the morning or in the evening (assuming the temperature has cooled down sufficiently). What Puts You at Risk of Heatstroke? The heat can be deadly for the very young. Their internal thermostat isn’t yet fully developed, putting them at risk of heatstroke. Heatstroke also is a serious risk in older people, because aging compromises the body’s ability to keep cool. One of the ways the body naturally responds to rising temperatures is by dilating blood vessels in the skin. This draws heat from inside the body to the skin’s surface—perspiration. This process helps us cool you down, but as we get older, the ability to perspire can diminish, and blood vessels don’t dilate as efficiently—thus, heatstroke becomes more likely. Heatstroke symptoms can develop rapidly depending on a person’s medical condition and the circumstances that individual is in. Certain chronic medical conditions also raise the risk of heatstroke, since they impair thermoregulation by the brain and nervous system. These conditions include cardiovascular, neurological, and psychiatric disorders, lung diseases (such as chronic obstructive pulmonary disease), obesity, and frailty. 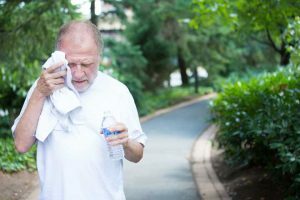 Certain medications that older adults are more likely to take (such as diuretics and other blood pressure drugs, sedatives, and tranquilizers) also may interfere with the body’s cooling mechanisms, increasing the risk of heatstroke. 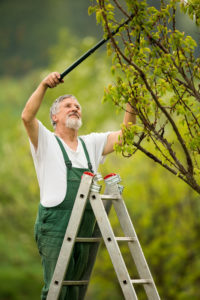 Other seniors may have mobility difficulties that prevent them from getting out of a hot environment. And, with aging, the thirst reflex declines, increasing the likelihood of dehydration. The body mechanisms that counteracted dehydration when you were younger often become impaired as a part of normal aging. This leads to greater loss of fluids, and an increased likelihood of heatstroke and other heat-related illnesses. Even when dehydrated, many older people don’t feel thirsty and thus don’t compensate for their water volume loss. You also may be susceptible to heat exhaustion and/or heatstroke if you overexert yourself in high temperatures, if you are exposed to extreme heat when you aren’t used to it (for example, if you vacation in a hot climate), or if you are obese. 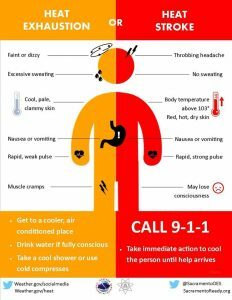 Do you know the difference between heat exhaustion and heatstroke? Weather.gov supplies this infographic to differentiate. Recognizing when the heat is starting to get to you is critical, because there are easy steps you can take to avoid medical emergencies. Keep in mind that a young child may not be able to tell you when he or she is too hot, while a senior may not even realize it, since he’s less sensitive to changes in their body temperature. 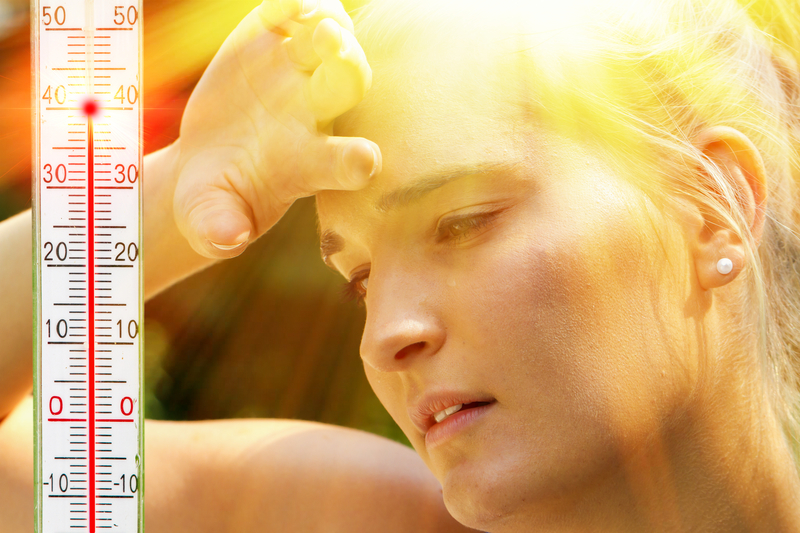 Early signs of heat exhaustion can include profuse sweating, weakness, nausea, vomiting, headaches, and muscle cramps. If someone has signs of heat exhaustion, it’s vital to move him or her to a cooler environment and take steps to hydrate (tepid water is best). Sunburn: How Bad Is It for Your Health? Heatstroke symptoms can develop rapidly depending on a person’s medical condition and the circumstances surrounding individual (such as going without fluids for an extended time, being in an overheated room without ventilation, or long stretches in direct sun). Heatstroke can cause irreversible organ damage if not treated quickly, so if someone has signs of heatstroke, treat it as a medical emergency—call 911 and take steps to cool the person. If he or she is in an overheated room or building, remove him from that location or lower the temperature in that space. Applying towels soaked in cool water to the person’s skin, or spritzing him with cool water and blowing cool air at him with a fan will help to lower his temperature. If you are outside, spray the person with a garden hose, if that is the most convenient source of cool water. Get the person to drink as much as possible—cool water is usually the best fluid to consume, but certain sports drinks, such as Gatorade, are helpful because they replace sodium and minerals lost in perspiration. Avoid alcohol and sugary drinks (such as soda) because they can cause the body to lose more fluids. Also avoid iced fluids if possible, since these may cause stomach cramps. AC AND SHADE: Keep your home cool with air conditioning if affordable, and by lowering window shades during the day. MADE IN THE SHADE: Try to stay out of the sun between 10 a.m. and 4 p.m. CONSIDER CLOTHING: Wear lightweight, light-colored, loose-fitting clothes when you’re outside. OUTDOOR SMARTS: If you enjoy exercising outside, do it first thing in the morning or in the evening (assuming the temperature has cooled down sufficiently). HYDRATE: Drink fluids throughout the day. If you’re outdoors or engaging in exercise in the heat, drink between 16 and 32 ounces of cool fluids per hour, unless otherwise directed by your doctor. OUT AND ABOUT: On days of high heat, go to public places that have air conditioning—malls, senior centers, libraries, and movie theaters, for example. BUDDY SYSTEM: Spend time with others so that someone can take action if you start to experience heat-related symptoms. This is especially true when exercising or spending extended time outdoors. CAR CAUTION: Never leave a young child or older adult in a parked car on a hot, sunny day—the temperature inside can increase rapidly. MEDS AND RISK: Find out whether any medications you or a loved one take raise the risk for heat-related illness and heatstroke. VACATION TIME TIPS: If you’re vacationing in a hot climate, spend a day or two acclimating before engaging in sightseeing. aging, alcohol, blood pressure, blood pressure drugs, brain, cardiovascular, chronic obstructive pulmonary disease, cramps, dangers, dangers of dehydration, dehydration, dehydration headache, exercise, headache nausea, headaches, health, lung diseases, medical conditions, mobility, muscle, muscle cramps, natural cures for, natural cures for nausea, obesity, obstructive pulmonary disease, pulmonary disease, skin, stomach cramps, sunburn, weather. I think a very important point that was overlooked to overheating is not to wear a hat that is solid ,mesh hats are okay because heat escapes through the head .